It's September 1943 near Richmond, Virginia and Bishop brothers, Wesley, 10, and Charles, 14, have been living with the Ratcliff family for over three years now, after being evacuated from war-torn London. And there is nothing Charles, called Chuck by his American family, would like more than to return home and do his bit for the war, but his parents still refuse to let him. Besides, Wesley still has frequent nightmares about firebombs hitting their home during the Blitz and about the possibility of being torpedoed by Nazi submarines while crossing the U-boat infested waters of the Atlantic and Charles feels responsible for taking care of him when they happen. The Ratcliffs are a large farming family. Patsy, the only girl, is 16 and has a boyfriend named Henry flying missions overseas, next is Bobby, 15, who has become a great pal of Chuck's, followed by Ron, 12, Wesley's real nightmare, and lastly are the twins, Jamie and Johnny, 7. The war is a constant presence in this novel, making it truly a home front story. Life isn't always easy for the Bishop brothers. Ron has always jumped at every opportunity to bully Wesley. So when Wes ends up skipping two grades and, much to Ron's annoyance, lands in his 7th grade class, the bullying only intensifies. Charles, who has become quite muscular from farm work, has made it onto the football team along with Bobby. Everyone must help out on the farm and the work is long and difficult, because of a dWes has a fascination for Native Americans that he has read about and longs to meet one, but when he does, much to his surprise, Mr. Johns is nothing like what he expected. Wes also befriends a young African American boy, and learns first hand about segregation and prejudice. And Chuck must come to terms with his feelings about the German POWs that are brought into the area and used to help on the farms, and, ultimately, on the Ratcliff farm as well. The more he sees them, the angrier he becomes and the more he wants to go home and help. Chuck is also dealing with a crush he has on Patsy, which is especially hard on him, since he knows that her heart belongs to someone doing just what he wishes he could do. Across a War-Tossed Sea follows the Bishop boys and the Ratcliff family through the year up to and a little beyond the D-Day invasion at Normandy, France in June 1944. It is a nice home front book that gives a good idea of what life was like for people in the United States, interspersed with letters exchanged between the boys and their parents, giving the reader a good picture of life in England under siege. In fact, this is really like a series of vignettes all connected to each other. Given all the things that happened in this novel, I thought it was odd that after living with the Ratcliffs for over three years, the boys would feel like new arrivals and make the kind of mistakes that would most likely happen in their first year. But that didn't diminish my feelings about the story. I thought Across a War-Tossed Sea was an exciting, interesting, thought provoking novel documenting life on the home front and the adjustments that had to be made by everyone during World War II. At the end of the book, there is a very informative Afterword giving a short recap of what was going on in Europe, the evacuation of children overseas that sometimes ended in tragedy and further explaining many of the things referred to in the novel, such as U-boats, V-bombs and secret air bases (a particularly amusing part of the novel, even though it involves a runaway German POW). 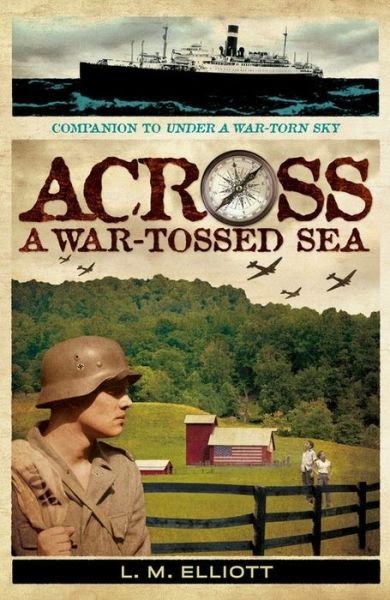 Across a War-Tossed Sea is a companion book to Across a War-Torn Sky, which follows what happens to Patsy Ratcliff's boyfriend, Henry Forester, after he is shot down over France on a flying mission for the Air Force. And, bringing things full circle, they are both companion pieces to A Troubled Peace, and the end of the war. Luckily, I have not read the two companion books yet, so I have them to look forward to.